"A large comfortable house in Kylerhea Glen on the Isle of Skye"
Welcome to the Old Inn in the village of Kylerhea on the Isle of Skye off the West Coast of Scotland. This large house can accommodate 13 people easily and is ideal for large family or group self-catering accommodation. It is also perfect for smaller groups of four to six people. 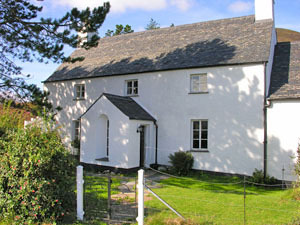 The main house has four bedrooms including one double bedroom, a twin bedroom and two single bedrooms. The annex to the house has two bedrooms consisting of a double bedroom and a dormitory of five beds. The Old Inn offers an ideal retreat in a quiet, tranquil and beautiful part of Skye. Kylerhea is a small township of 15 houses and it is the closest place on Skye to the mainland of Scotland. 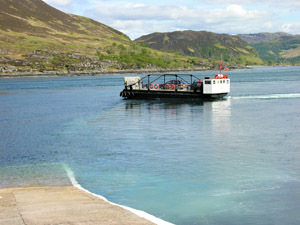 The Kylerhea narrows are infamous for the swift current which flows at up to 8 knots. Traditionally cattle from Skye and the Outer Isles were transferred through Kylerhea on the drover's road and swam across the narrows with the cattle herders staying at the Old Inn. The Kylerhea glen and surrounding mountains are designated a Special Area of Conservation due to it's rare plants and wildlife such as otters. The Kylerhea otter haven is a short walk from the Old Inn and this is a free wildlife hide overlooking the coastline where otters can sometimes be observed as well as numerous seals and bird life. Golden eagles are also regularly seen hunting for red grouse across the hillside at the back of the house and on rare occasions white tailed sea eagles can be seen fishing near the jetty. The village of Broadford is a 25 minute drive from the Inn along a seven mile single track road over a 900 ft pass. Broadford is the second largest village on the island. Broadford has a large supermarket, shops, bank, library, petrol station, pubs, cafes and several restaurants (most closed in winter). For a special meal Lady Claire MacDonald's Kinloch Lodge is near Broadford or the famous Three Chimney's restaurant is to the north of the island. More locally there is the Glenelg Inn, about 3 miles from the ferry jetty on the mainland. The Old Inn offers a tranquil haven on Skye and a chance to escape to a beautiful and peaceful location. For the more active Skye offers a range of activities including walking, mountaineering, cycling, fishing, kayaking, golf, wildlife watching or just enjoying the amazing mountain scenery. Around Kylerhea there are a number of interesting mountain and coastal walks including a visit to the ancient Brochs of Glenelg. 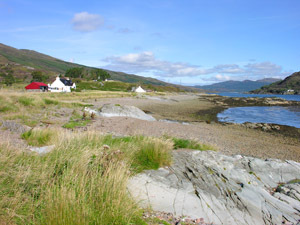 For younger children Kylerhea has a superb shingle beach with a large resident seal population as well as several otters. Glenelg beach is a ferry ride (open April to October) and short walk away and has a large expanse of sand at low tide. Finally the Old Inn is mentioned in the book "Tom Brown's school days" by Thomas Hughes published in 1857. "He had rushed away from Oxford the moment that term was over, for a fishing ramble in Scotland with two college friends, and had been for three weeks living on oatcake, mutton-hams, and whisky, in the wildest parts of Skye. They had descended one sultry evening on the little inn at Kyle Rhea ferry; and while Tom and another of the party put their tackle together and began exploring the stream for a sea-trout for supper, the third strolled into the house to arrange for their entertainment." View of Kylerhea glen looking east from the top of Beinn Aslak. Copyright © 2009 Kylerhea Old Inn Website by Skye Images.